The Gospel of Matthew (literally, "according to Matthew"; Greek, Κατά Μαθθαίον or Κατά Ματθαίον, Kata Maththaion or Kata Matthaion) is a synoptic gospel in the New Testament, one of four canonical gospels. It narrates an account of the life and ministry of Jesus of Nazareth. It describes his genealogy, his miraculous birth and childhood, his baptism and temptation, his ministry of healing and preaching, and finally his crucifixion and resurrection. The resurrected Jesus commissions his Apostles to "go and make disciples of all nations." The Christian community traditionally ascribes authorship to Matthew the Evangelist, one of Jesus' twelve disciples. Augustine of Hippo considered it to be the first gospel written (see synoptic problem), and it appears as the first gospel in most Bibles. Secular scholarship generally agrees that it was written later, and authorship was ascribed to Matthew as was common in the ancient world. According to the commonly accepted two source hypothesis, the author used the Gospel of Mark as one source and the hypothetical Q document as another, possibly writing in Antioch, circa 80-85. Of the four canonical gospels, Matthew is most closely aligned with the Jewish tradition, and the author was apparently Jewish. Most scholars consider the gospel, like every other book in the New Testament, to have been written in Koine Greek, though some experts maintain the traditional view that it was originally composed in Aramaic. The gospel is associated with noncanonical gospels written for Jewish Christians, such as the Gospel of the Hebrews. For convenience, the book can be divided into its four structurally distinct sections: Two introductory sections; the main section, which can be further broken into five sections, each with a narrative component followed by a long discourse of Jesus; and finally, the Passion and Resurrection section. The discourses and actions of John the Baptist preparatory to Christ's public ministry (Matthew 3; Matthew 4:11). The discourses and actions of Christ in Galilee (4:12–26:1). The "Church Order" Discourse, concerning relationships among Christians (18–19:1). The Eschatological Discourse, which includes the Olivet Discourse and Judgement of the Nations, concerning his Second Coming and the end of the age (24–25). The sufferings, death and Resurrection of Jesus, the Great Commission (28:16–20). The one aim pervading the book is to show that Jesus of Nazareth was the promised Messiah—he "of whom Moses in the law and the prophets did write"—and that in him the ancient prophecies had their fulfillment. This book is full of allusions to passages of the Old Testament which the book interprets as predicting and foreshadowing Jesus' life and mission. This Gospel contains no fewer than sixty-five references to the Old Testament, forty-three of these being direct verbal citations, thus greatly outnumbering those found in the other Gospels. The main feature of this Gospel may be expressed in Jesus' pronouncement that "I am not come to destroy, but to fulfill" the law(5:17). See also Expounding of the Law. This Gospel sets forth a view of Jesus as Christ and portrays him as an heir to King David's throne, the rightful King of the Jews. The cast of thought and the forms of expression employed by the writer show that this Gospel was written by Jewish Christians of Iudaea Province. Some believe this gospel was written to the Jewish community, thus explaining all the allusions to passages of the Old Testament, however, see also Great Commission (which is directed at "all nations") and Sermon on the Mount#Interpretation and Old Testament#Christian view of the Law. 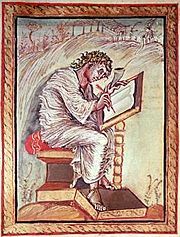 Saint Matthew, from the ninth-century Ebbo Gospels. In 1911, the Pontifical Biblical Commission affirmed that Matthew was the first gospel written, that it was written by the evangelist Matthew, and that it was written in Aramaic. The relationship of Matthew to the Gospels of Mark and Luke is an open question known as the synoptic problem. The three together are referred to as the Synoptic Gospels and have a great deal of overlap in sentence structure and word choice. Out of a total of 1,071 verses, Matthew has 387 in common with Mark and the Gospel of Luke, 130 with Mark alone, 184 with Luke alone; only 370 being unique to itself. Although the author of Matthew wrote according to his own plans and aims and from his own point of view, most scholars agree he borrowed extensively from Mark, and possibly another source or sources as well. The most popular view in modern scholarship is the two-source hypothesis, which speculates that Matthew borrowed from both Mark and a hypothetical sayings collection, called Q (for the German Quelle, meaning "source"). A similar but less common view is the Farrer hypothesis, which theorizes that Matthew borrowed material only from Mark, and that Luke wrote last, using both earlier Synoptics. A minority of scholars subscribe to Early Christian tradition, which asserts Matthean priority, with Mark borrowing from Matthew (see: Augustinian hypothesis and Griesbach hypothesis). The two-source hypothesis is based on the fact that all three gospels have many passages, with virtually exact wording, in common. It is generally believed that it is more likely that Matthew and Luke expanded on the shorter gospel of Mark, rather than Mark editing out large sections of Matthew. In The Four Gospels: A Study of Origins (1924), Burnett Hillman Streeter argued that a third source, referred to as M and also hypothetical, lies behind the material in Matthew that has no parallel in Mark or Luke. Throughout the remainder of the twentieth century, there were various challenges and refinements of Streeter's hypothesis. For example, in his 1953 book The Gospel Before Mark, Pierson Parker posited an early version of Matthew (proto-Matthew) as the primary source of both Matthew and Mark, and the Q source used by Matthew. There is little in the gospel itself to indicate with clarity the date of its composition. The majority of scholars date the gospel between the years 70 C.E. and 100 C.E. The writings of Ignatius possibly reference, but do not quote, the Gospel of Matthew, suggesting the gospel was completed at the latest circa 110. Scholars cite multiple reasons to support this range, such as the time required for the theological views to develop between Mark and Matthew (assuming Markan priority), references to historic figures and events circa 70, and a later social context. Some significant conservative scholars argue for a pre-70 date, generally considering the gospel to be written by the apostle Matthew. In December 1994, Carsten Peter Thiede redated the Magdalen papyrus, which bears a fragment in Greek of the Gospel of Matthew, to the late first century on palaeographical grounds. Most scholars date this fragment to the third century, so Thiede's article provoked much debate. A minority of Christian scholars argue for an even earlier date, as seen in the 1911 Catholic Encyclopedia: "Catholic critics, in general, favor the years 40–45…"  In recent times, John Wenham, one of the biggest supporters of the Augustinian hypothesis, is considered to be among the more notable defenders of an early date for the Gospel of Matthew. There are numerous testimonies, starting from Papias and Irenaeus, that Matthew originally wrote in Hebrew letters, which is thought to refer to Aramaic. In the sixteenth century Erasmus was the first to express doubts on the subject of an original Aramaic or Hebrew version of the Gospel of Matthew: "It does not seem probable to me that Matthew wrote in Hebrew, since no one testifies that he has seen any trace of such a volume." Here Erasmus distinguishes between a Gospel of Matthew in Hebrew letters and the partly lost Gospel of the Hebrews and Gospel of the Nazoraeans, from which patristic writers do quote, and which appear to have some relationship to Matthew, but are not identical to it. The Gospel of the Ebionites also has a close relationship to the Gospel of the Hebrews and Gospel of the Nazoraeans, and hence some connection to Matthew. The similarly named Gospel of Pseudo-Matthew has almost nothing to do with Matthew, however, and instead is a combination of two earlier infancy Gospels. Most contemporary scholars, based on analysis of the Greek in the Gospel of Matthew and use of sources such as the Greek Gospel of Mark, conclude that the New Testament Book of Matthew was written originally in Greek and is not a translation from Hebrew or Aramaic (Greek primacy). If they are correct, then the Church Fathers such as Clement of Alexandria, Origen, and Jerome possibly referred to a document or documents distinct from the present Gospel of Matthew. A smaller number of scholars, including the Roman Catholic Pontifical Biblical Commission, believe the ancient writings that Matthew was originally in Aramaic, arguing for Aramaic primacy. These scholars normally consider the Peshitta and Old Syriac versions of the New Testament closest to the original autographs. Biblical scholar Stephen L. Harris of the Jesus Seminar mentions that the claims for Matthew Levi authorship could actually be references to "an early Christian, perhaps named Matthew, who assembled a list of messianic prophecies in the Hebrew Bible, a collection that the creator of our present gospel may have used." The Jesus narrative would then have been assembled around these Tanakh (Old Testament) verses. The Gospel of Matthew is clearly written for a Jewish audience, moreso than the other gospels. It is a kind of apology intended to explain that Jesus of Nazareth was the long-awaited Jewish Messiah, while at the same time redefining that concept to explain why Jesus was not received by those to whom he was sent. This entails a certain amount of redefinition of that role. Matthew makes abundant use of Old Testament references and places many Old Testament phrases into the mouth of Jesus. There are many references to Moses. The birth narrative ends with Jesus and family going into Egypt to escape Herod's slaughter of the infants—both elements of the story are taken from the Moses' life. The Sermon on the Mount recalls the giving of the Law on Mount Sinai. (In the Gospel of Luke, Jesus goes to a low place to deliver the "Sermon on the Plain." Jesus asserts in Matthew that he has not come to repeal the law but to fulfill it. From a Christian perspective, the Gospel of Matthew reinterprets the meaning of the Old Testament and the concept of the Messiah. "Matthew's gospel, more clearly than the others, presents the view of Jesus as himself the true Israel, and of those who have responded to his mission as the true remnant of the people of God … to be the true people of God is thus no longer a matter of nationality but of relationship to Jesus. Due to the failure of the Jewish people to receive Jesus, Matthew also must explain what prevented him from being recognized as the coming Jewish Messiah. The Matthean interpretation was at odds with the then current Jewish expectation–that the Messiah would overthrow Roman rulership and establish a new reign as the new King of the Jews. Matthew appears to place the blame for the failure of Israel to receive Jesus on the Jewish leaders, especially the Pharisees, who are presented as combative, argumentative and hide-bound. Two stories of his encounter with the Pharisees, "plucking the grain" and healing on the Sabbath, demonstrate their excessive concern with rules and the extent to which they misunderstand the spirit of the Law. This conflict between Jesus and the Jewish leaders ultimately results in his death. Some scholars have speculated that the conflict in the text mirrors the conflict in the late first century between the Jewish and early Christian communities as the Christian sect moved away from Synagogue worship, and have used that rationale to argue for a late first century date for Matthew's origin. ↑ "ΚΑΤΑ ΜΑΘΘΑΙΟΝ" is found in Codex Sinaiticus and Codex Vaticanus. Nestle-Aland. Novum Testamentum Graece, 27th ed. (Druck: Deutsche Bibelgesellschaft, 1996), 1. ↑ Francis E. Gigot Synoptics entry in The Catholic Encyclopedia. Retrieved October 29, 2007. ↑ Burnett H. Streeter, The Four Gospels. A Study of Origins Treating the Manuscript Tradition, Sources, Authorship, & Dates. (London: MacMillian and Co., Ltd., 1924). ↑ Herman N. Ridderbos. Matthew: Bible student's commentary. (Grand Rapids, MI: Zondervan, 1987), 7; from earlychristianwritings.com Retrieved October 29, 2007. ↑ Francis Wright Beare. The Gospel according to Matthew. 7; from earlychristianwritings.com Retrieved October 29, 2007. ↑ R. T. France. New Bible Commentary. (Inter Varsity Press). Brown, Raymond E. Introduction to the New Testament. Anchor Bible, 1997. ISBN 0385247672. Harris, Stephen L. Understanding the Bible. Palo Alto: Mayfield, 1985. Pierson Parker. The Gospel Before Mark. Chicago: University of Chicago Press, 1953. Gospel of Matthew NLT version with drill-down concordance. History of "Gospel of Matthew"
This page was last modified on 27 June 2017, at 16:13.